The Green Saviours team during their 54th plantation drive planted 3000+ trees at Hanji Farms, Santi Bastwad, Belagavi. 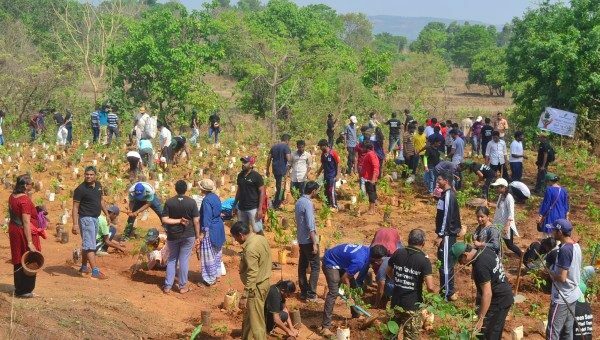 Over 300 volunteers including members of Rotary Club Venugram, students from Love Dale School, Bharatesh Group of institutions, students from Kannada Balaga of GIT and several other people from all walks of life worked with the Green Saviours team and planted saplings on the 14000 sqft site using the Miyawaki Method. Renowned Ethno Botanist Dr. Vinaya Ghate from Pune graced the occasion and expressed satisfaction over the attempt of the Green Saviours to plant native trees. She congratulated the team and all participants for their commitment which has seen the team work over 54 Sundays without a break. The Green Saviours team achieved a major milestone. They have planted 3000+ trees over the last year and today planted the same numbers on a single day. The team is grateful to Shanti Iron and Steel and Rotary Club Of Venugram who were the major sponsors for the project and contributed Rs 1 lakh. The team owes a special gratitude to the Hanji Family for providing the land for the mini forest and promising to take care of it. The Department of Forestry provided saplings for the said mini forest.